Windows 10 allows us to choose a color for the taskbar, title bar, start menu, window borders, selection box and some other areas of the operating system by picking an accent color in the personalization section of Settings app. Window color and appearance feature has been dropped from Windows 10. 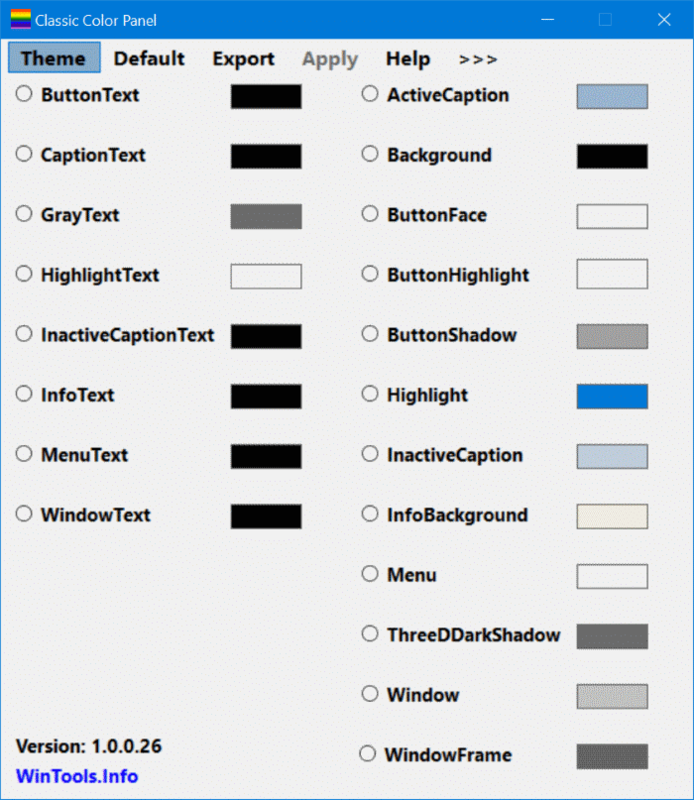 Because of this, unlike in Windows 7 and previous versions, there is no option to set your color for the menu, button text, menu text, and window frame in Windows 10. You need to manually edit the Registry to change the color of these items. 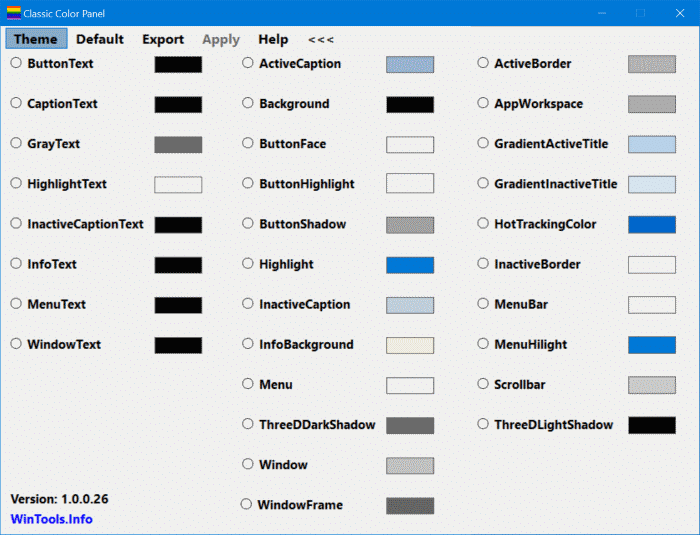 Classic Color Panel is a new free utility from the developer behind System Font Changer (a utility to change system fonts in Windows 10) for Windows 10 designed to help you change the default color of various items of Windows 10. With Classic Color Panel, you can change the color of button text, caption text, highlight text, info text, menu text, inactive caption text, window text, active caption, background, button face, button highlight, button shadow, highlight, inactive caption, info background, menu, window and window frame, active border, app workspace, inactive border, menu bar, scroll bar and some other areas of the operating system with a click. The Classic Color Panel allows you to choose your color for areas mentioned above of Windows 10. By default, Classic Color Panel shows only 20 items. To see all items, click the >>> button located at the top. Balloon tips are available for each item in the list. So, if you are unsure about an item, simply hover the mouse cursor on the item in Classic Color Panel to see the description. Upon launching the program for the first time, the program offers you an option to save the default settings to a Registry file so that you can restore original colors for all items with a click. While using the program, you can restore default color and export new colors to a registry file. To change the color of an item, select the radio button next to it, click on the color to pick a color of your own choice and then click Apply. When you are asked, log off and log in again to see the change. Overall Classic Color Panel is an impressive piece of software for Windows 10. The program comes in handy, especially for those users who love customizing Windows 10. Classic Color Panel is fully compatible with both 32-bit and 64-bit types of Windows 10. Visit the following page to download the latest version of Classic Color Panel utility. IMPORTANT: Windows SmartScreen might warn you against downloading and running Classic Color Panel, but the program is safe to use. Could someone provide a user guide or manual to help users employ this application correctly so that it will not ruin the appearances of opened folders, files, or applications? will this change the color of outlook in office 2016 home and business?